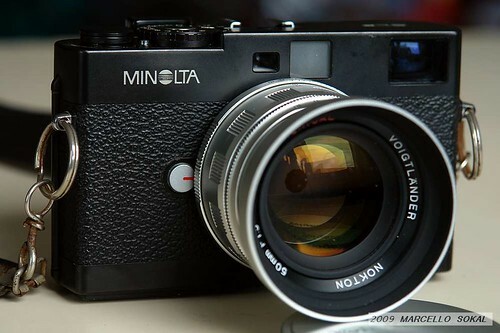 The Minolta CLE is a TTL-metering aperture-priority automatic 35mm rangefinder camera taking Leica M lenses, introduced by Minolta in 1981. Leica and Minolta signed a technical cooperation agreement in June 1972. One of its results was the joint development of the Leica CL, a compact rangefinder camera introduced in 1973 and discontinued a few years later. 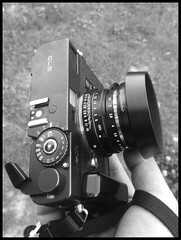 The CLE was a new rangefinder body resembling the Leica CL. The Minolta CLE has an electronic focal plane shutter to 1/1000, and a through-the-lens CdS exposure meter with aperture-priority automatic or manual exposure, and automated TTL flash exposure. None of these features would appear on any other body for M-mount lenses until the Konica Hexar RF of 1999 (which has all but the last). The viewfinder has projected frames for 28mm, 40mm and 90mm focal lengths. The Minolta CLE is reputed to be reliable, but electronic faults would likely be unrepairable today. Typical faults are LED malfunction and a locked shutter. The LED malfunction has been corrected by connecting non OEM flash which routes high current through the flash discharge circuit, evidently circumventing perceived "corrosion" of electrical contacts, which for some reason returns the LED function to normal. The second fault, that of shutter lock up after the camera has been left unused for some time, has been corrected by manually moving a shutter part located under a circuit board in the base of the camera. This contributor has performed these repairs, however it is not suggested that persons with non technical expertise attempt the shutter repair as dismantling the base requires some repair experience in order to properly reassemble the camera without breakage. Neither of these repairs required replacement of parts and it is this contributors understanding that, in fact, there are repair shops who regularly service these cameras as of July 2016. 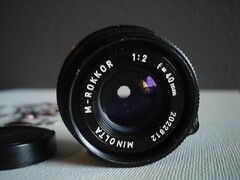 Three lenses were made by Minolta specially for the CLE: the M-Rokkor 28mm f:2.8 wide-angle, the M-Rokkor 40mm f:2 standard and the M-Rokkor 90mm f:4 tele. The 28mm lens has some problems with the durability of the coating, and it is recommended to check the presence of white spots on the coating before buying. The Minolta CLE was sold in black finish, except for a gold edition, limited to 300 and sold only in the Japanese market. The top plate is gold with black engravings. The bottom plate, strap lugs, hot shoe and lens release button are gold too, as well as the metal parts of the advance lever and shutter release. The shutter speed disc and lens rings have gold colour numbers. The set includes a standard lens with gold plated bayonet mount and a leather case with a plate marked CLE GOLD LIMITED. ↑ Year and month: Francesch, p.49. ↑ See this page at Cameraquest. ↑ Observation of a gold CLE in an online auction.